Apartment List recently published our annual report on millennials and homeownership. Our research indicates that most millennial renters want to purchase a home, but based on current savings rates, many will need a decade or more before they can afford a 20% down payment. Faced with stagnant incomes and rising home prices, many millennials will be forced to delay homeownership, migrate to more affordable cities, or take on more debt. Our report raises the question – why aren’t millennials saving? Some have blamed rising student debt loads, while others suggest that millennials are financially irresponsible. Today, we release research indicating that, in general, college-educated millennials with student debt have to save for 10 years to afford a 20% down payment, compared to 5 years for those without debt. 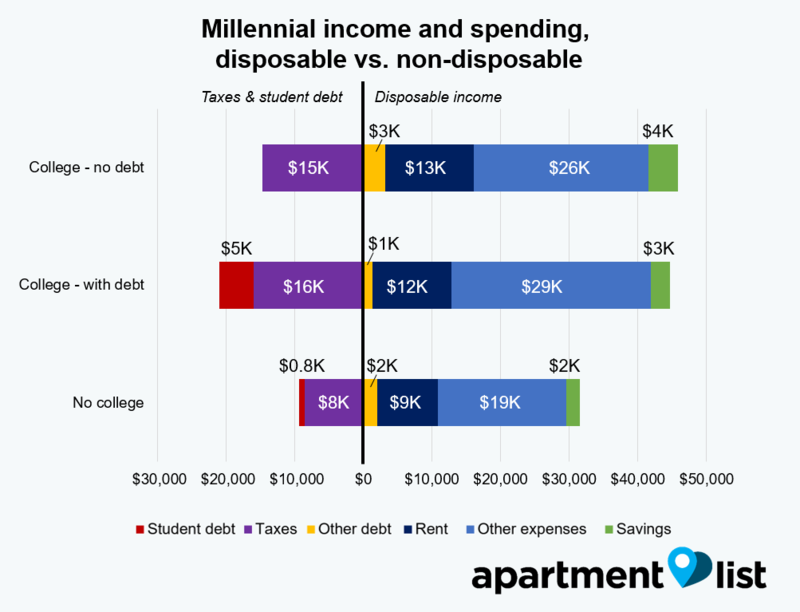 Our analysis also suggests, however, that this is at least partly by choice – millennials with student debt payments spend just as each month as those without, instead of cutting back on discretionary expenses to save more for a home. Among millennials without a college degree, however, the outlook for homeownership is bleak. Faced with rising rents and stagnant incomes, most are not saving enough. They also receive much less financial support from friends and family, and will need more than 15 years to save enough for a 20% down payment. Nearly all metros across the United States are unaffordable for millennials without a college degree. We began by analyzing data from our survey to better understand the burden of student debt that college graduates face. 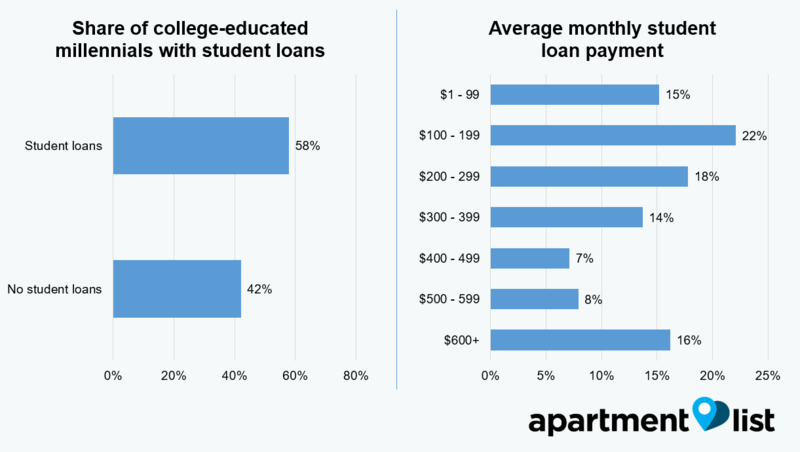 Among college-educated millennials in our study, 57% make a student debt payment each month. Of these, 37% pay less than $200 a month. The average monthly payment for millennials across the United States with student debt is $410 each month. Given that the average millennial in our survey only saved ~$210 each month towards a down payment, these student debt payments are significant – many college graduates could double or triple their savings each month if they did not have student loans. Doing so would allow them to reduce the time needed to save for a home, putting homeownership within closer reach for more millennials. Student loan payments may be expensive, but we theorized the possibility that college graduates have higher incomes, allowing them to save more each month, even after making student loan payments. To confirm this, we compared incomes and monthly savings rates for three groups: (1) college-educated millennials with no debt, (2) college-educated millennials with debt, and (3) millennials without a college degree. 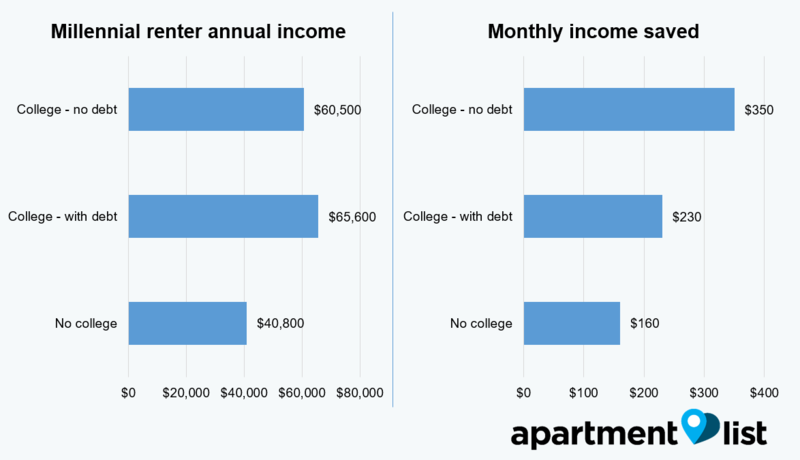 Our data indicates that overall, millennial renters with a college degree have significantly higher incomes – roughly $22,600 more each year than those without a college degree. Millennials who have earned graduate degrees tend to bring in higher income, but are also more likely to have student debt. When comparing savings rates, college-educated millennials with no student debt save $350 each month, ~50% more than those who do have student debt. Even so, college-educated millennials still save more than those without a college degree. The results are illuminating. College graduates with debt have higher incomes than those without, but after accounting for higher taxes and student debt payments, their disposable income is ~$1,100 lower. However, both groups spend roughly the same amount on rent, other debt (e.g., credit card debt, car loan payments, etc. ), and other expenses. This suggests that, in order to afford their student loan payments, millennials are reducing the amount they save, instead of cutting back on discretionary expenses like travel, dining out, and shopping. The comparison between college graduates and non-college graduates is interesting too. Millennials without a college education have smaller student debt payments (not zero), but their disposable incomes are ~30% lower. Despite this, they manage to put away ~$2K annually. 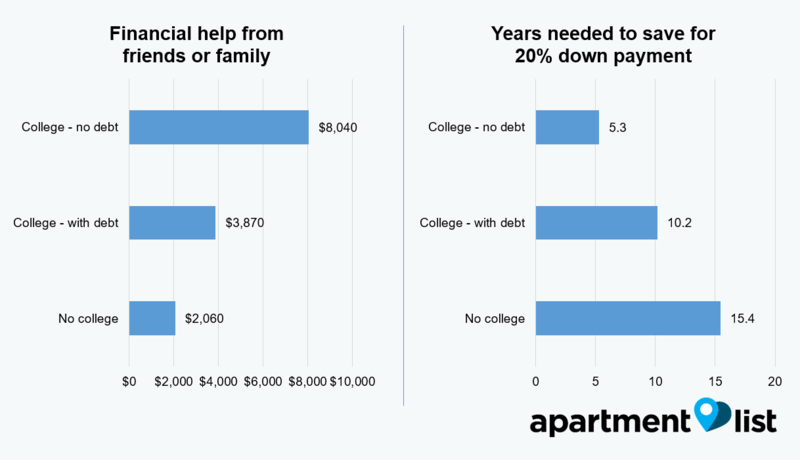 College graduates (with or without debt) have significantly higher incomes, but aren’t saving much more: overall, they allocate 25% of incremental income towards rent, 65% towards other expenses, and only 10% towards savings. In other words, if a college-educated millennial receives a $10,000 increase in disposable income, they would likely spend $2,500 on a nicer apartment, $6,500 on travel, dining out, and other purchases, and only put $1,000 towards savings. Based on this, it seems that millennials may have the capacity and ability to save more for a home if they so choose. We see the same pattern repeated across major metros in the US. 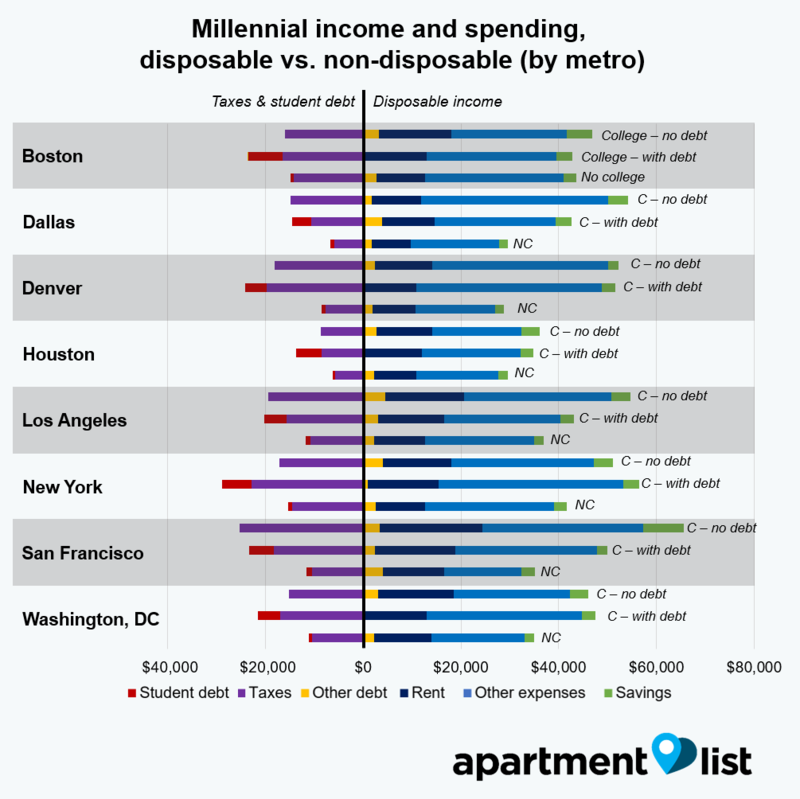 Even after accounting for higher tax rates and student debt payments, millennials with a college degree have more disposable income; in some metros, the difference was 75% or more. Despite this, millennials with higher incomes don’t appear to be putting much of it towards savings. In Minneapolis, for example, the average college graduate has upwards of $20,000 more disposable income, but is only saving $860 more each year. 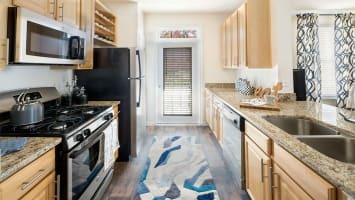 The length of time a renter needs to save for a down payment depends largely on their monthly savings rates, but some lucky millennials receive financial support from friends and family as well, helping to defray the high initial cost of homeownership. In our analysis, 32% of college graduates anticipate receiving some help from friends and family, but only 22% of non-college graduates do. Interestingly, college graduates with no debt receive much larger amounts – $8,040, compared to $3,870 for graduates with debt, and $2,060 for millennials without a college degree. It seems likely that many college graduates with no debt may have received help paying for college as well. 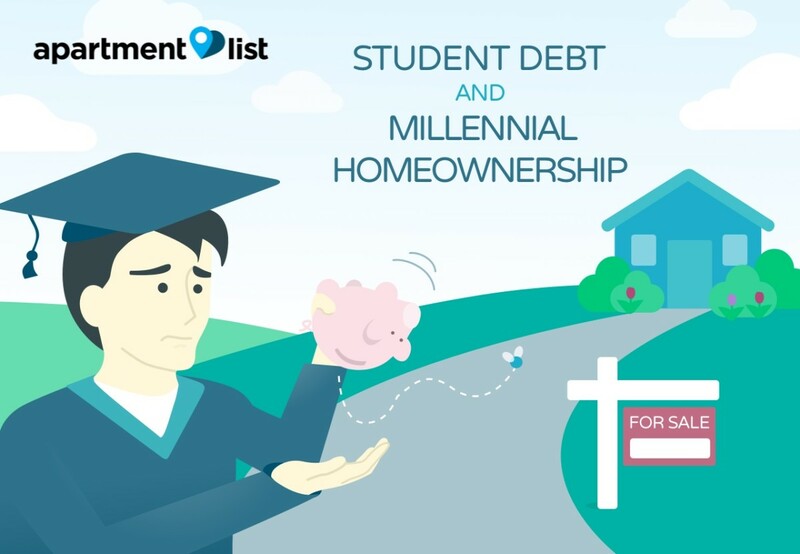 Nationwide, college-educated millennials with no debt need 5.3 years to afford a home, but how does this change according metro? To answer this question, we looked at how long millennials in 26 metros across the US would need in order to save enough for a 20% down payment. Overall, college-educated millennials need less than six years to afford a 20% down payment in 21 out of 26 metros, with metros in the South and Midwest being especially affordable. The only metros that required more than 6 years of savings were Denver, San Francisco, LA, Seattle, and Phoenix. Cities like San Francisco are expensive even for college graduates without debt: they are saving $690 a month, on average, but still need 11 years to afford a 20% down payment. Next, we looked at the results for college-educated millennials with student debt. Nationwide, college-educated millennials with debt need 10.2 years to afford a home, but the results vary significantly across metros. 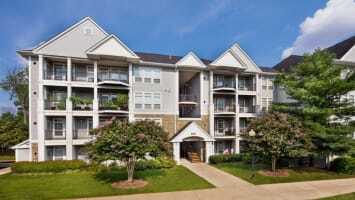 They need less than 6 years to save enough for a 20% down payment in 12 metros, mostly located in the Midwest and South. The West Coast remains unaffordable, however: they need more than 12 years to save enough for a home in LA, Portland, San Francisco, San Jose, and Seattle. The picture is quite different for millennials without a college degree. Almost every metro is unaffordable for this group, with 22 out of 26 metros requiring savings of more than 6 years, and 18 metros needing more than 9 years. The only metros that were affordable for non-college educated millennials were Atlanta (5.1 years), Philadelphia (5.0), Kansas City (4.8) and Detroit (0.9). Once again, San Francisco takes worst place for affordability – millennials without a college degree need a whopping 49 years, on average, to put away the $143,000 needed for a 20% down payment. The homeownership rate among millennials is steadily declining, and our research suggests that many millennials would buy sooner if they could afford it. Many have blamed rising student debt, and our research suggests that many college-educated millennials with student loans will be forced to delay homeownership, especially if they live in pricey cities on the West Coast. College graduates without debt, on the other hand, should be able to afford homes within six years on average, in nearly every metro across the US. Our analysis does also suggest, however, that millennials with student debt could likely be saving more, but are choosing not to do so. Despite the cost of monthly student loan payments, many are spending just as much as their less-indebted counterparts, choosing instead to cut back on savings in favor of other expenses. College graduates have significantly higher incomes, but aren’t saving that much more. Among millennials without a college degree, the situation is dire. Squeezed by rising rents and stagnant incomes, most are not saving enough. With the exception of the Midwest, millennials in most metros will need more than a decade to save enough for a 20% down payment. Some may be able to purchase with a smaller down payment, but many will be forced to delay or forsake homeownership, widening the inequality gap in our society. As with our earlier report, our data is taken from our annual renter survey, which had more than 30,000 responses nationwide. We define millennials as those aged 18-34, and only include respondents with a 4-year college degree or higher as college-educated. In some cases, renters may be able to purchase a home with less than 20% in down payment, but those who do so will often be required to purchase mortgage insurance, increasing the cost of their payment.